It’s a cornerstone of comic book mythology that heroes – and more than a few villains – are born out of tragedy, whether it’s an exploding planet, a murderous mugging in an alleyway or your dear old uncle popping his clogs just in time to drum the words “With great power comes great responsibility” into your selfish little bean of a brain. “Uprising” gives Malcolm Merlyn the secret origin treatment, told in flashback form to give us a breather from the ongoing Hong Kong narrative. It’s standard issue fare as far as backstories go: he vows revenge for the death of his wife, only to discover that taking a life doesn’t solve anything (it solves even less when you’ve taken the wrong life, of course). It’s a commendable attempt to deepen our understanding of the character but ultimately it backfires. Somehow Malcolm seemed an infinitely more complex and compelling figure before this week’s episode. Retrofitting him with such a well-worn motivation only serves to make him less ambiguous, less interesting, less of a story force. There was a magnetism to his hazy morality. John Barrowman does his best to sell Malcolm’s essential nobility but I can’t help feeling the character’s a more effective foil for Oliver as a mercurial trickster figure. The newspaper story on the death of Malcolm’s wife has a byline for David MacLean, a shout-out to the show’s storyboard artist. His other genre credits include The Flash, X2 and Caprica. This episode’s other ambition is to give Oliver a suitably heroic homecoming. There’s some obvious (and by now traditional) borrowing from Nolan’s Bat-verse: both the long trek home from the mountains and the citizens banding against their oppressors shamelessly ape elements of The Dark Knight Rises. 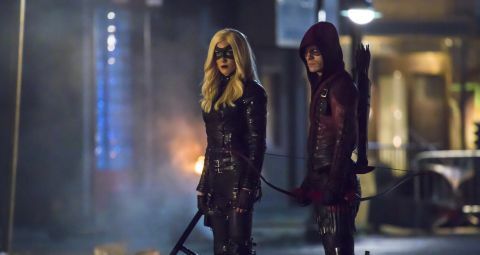 Here, however, the episode just misses: while there’s a stirring shot of an arrow shooting into the climactic melee, soundtracked by the show’s theme, Oliver’s return to Starling doesn’t feel nearly as triumphant as it should (and it should, by the essential laws of dramatic physics, feel equally as big as his apparent death in the mid-season finale). It’s left to Felicity – still the soul of the show – to give his comeback some real emotional resonance. The ever brilliant Emily Bett Rickards manages to make the words “I’m glad you’re not dead” sound like a slam. Merlyn was known as Merlyn the Magician when he first encountered Green Arrow in the comics. Malcolm’s aptitude for coin tricks in this episode appears to be a nod to this appellation. Can he do balloon animals too? Maybe balloon arrows? Brick states that he was once part of a gang known as the Orchid Bay Butchers. Orchid Bay’s an established part of DCU geography: first referenced in Green Arrow Vol 3 63, it’s the downtown part of Star City and the location of city hall.